To quickly move children and their families from homelessness to housing. To end the cycle of all homelessness for all children and their families within the Rappahannock Region. Our program is designed to improve the quality of life for our families by helping them move from homelessness to permanent housing. We offer educational opportunities and support services which include: intensive case management, tutoring, employment or vocational training, placement and referrals, life skills and social skills courses, stress management, as well as financial management, wellness and nutrition. We also provide transportation for those families without an automobile.We utilize the local community resources and make referrals for mental health counseling, domestic violence counseling, parenting classes, substance abuse treatment and medical/dental services Loisann's Hope House is funded through private donations and private, local, state, and federal grants. We are well established within our community with a strong presence and a good reputation for success. Donations, volunteers, and services provided to our organization from the community continue to flow. We are very thankful to have such great support for our program. Hope House is honored to bear the name of a compassionate, kind social worker who began her life in Fredericksburg. Loisann Silver Chacon was blessed with an extraordinary ability to connect with people. This gift served her well throughout her too-brief life, not only in her relationships with family and friends, but also in her career as a social worker. Over the years , she worked with mentally ill patients, young people who were homeless, abused children, and people trying to find their way. For more than two decades, Loisann was employed by Upward Bound, a government program that helps poor and minority students pursue a college experience. She was a counselor to the teens who wanted to attend college, helping them identify loans, fill out applications, and proof their writing samples. All who knew Loisann knew they had a true friend for life, and that she would be loyal and supportive, no matter what the circumstance. 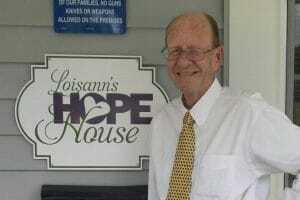 Loisann exemplified the ideals of Hope House, which strives to instill hope in and provide direction for hurting, children and their families. When members arrived at St. George’s Episcopal Church in Fredericksburg for a meeting, they found a homeless man sleeping in the entrance foyer. It was bitter cold and he was invited to take part in the meeting. After the meeting it was decided to call for a public meeting to address the problem. A committee was formed. The house at 902 Lafayette Blvd., Loisann's Hope House present location, was on the market for sale and it was decided to attempt to buy the property. An offer was made and financing was secured by the vestry and congregation of St. George's Church. Renovation began in early 1986 with many volunteers and contributions from the community. During 1986, the shelter was named "Hope House" at the suggestion of the Reverend Charles Sydnor. The doors of Loisann's Hope House were opened in January 1987 in the middle of a big snowstorm! In 1988, the Fredericksburg Area Association of Realtors raffled a house and netted more than $50,000, and with the assistance of a bank loan, enabled Loisann's Hope House to purchase the property from St. George's Church.